5-star hotel with magnificent view, courteous service, new wellness area and an excellent restaurant decorated with a Michelin star. Welcome to Alpenroyal Grand Hotel***** in Wolkenstein in Gröden! 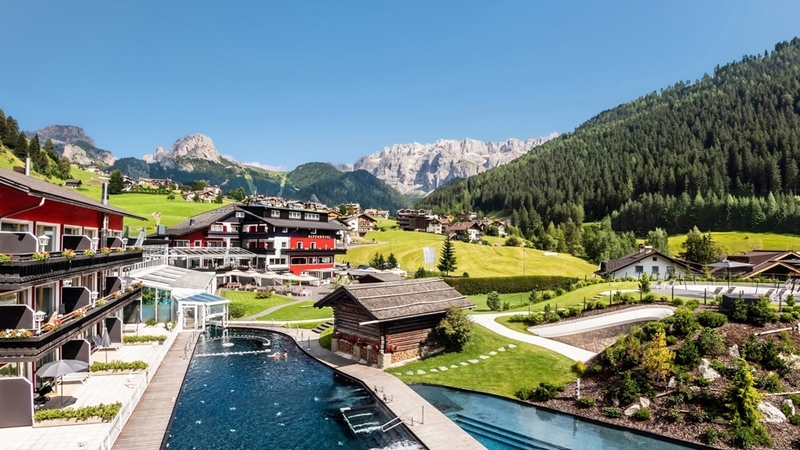 In the first 5-star hotel in Gröden Valley, an exclusive oasis in the heart of the Dolomites, you can enjoy dreamlike holidays. Alpenroyal Grand Hotel - Gourmet & Spa has a very long tradition and offers every conceivable comfort as well as spacious suites with a very special atmosphere. Due to the innovative architectural plan all areas of our house are characterised by a bright, inviting ambience. Large windowfronts allow a breath-taking view on the most beautiful mountains of the world, including wonderful walks and ski runs, which are easily reachable for you. Apart from pleasant premises furnished with high quality materials the excellent gourmet cuisine, individual service, countless peaceful corners and an extensive park rank among the advantages of Alpenroyal Grand Hotel. Not forgetting the unique spa area that fulfils every wellness wish. It would be the best if you would explore unforgettable “royal moments” by yourself.